JBWEB000069: description JBWEB000123: Access to the specified resource has been forbidden. I've added UA strings for att.net and att.com but that didn't help. Any suggestions welcome. Aite works fine in Edge. Ztruker wrote: I've added UA strings for att.net and att.com but that didn't help. You've added old UA - most websites ignores Fx 52 ESR version and are looking for latest. Change "52" (in all 4 places) with "60" and see what happens. Changed it to Mozilla/5.0 (Windows NT 10.0; WOW64; rv:52.0) Gecko/20100101 Firefox/60.0 then restarted Seamonkey but still get the same error when I try to login to MyATT.net. Something other than sniffing causing this I guess. I'll try it in Seamonkey Safe Mode. ... all I can see is blank page. ADB+ shows list of elements (not blocked on that site) but I can see blank page only. Fixed the other so both say 60.0, no help. Firefox 60.0.1 works on the MyAtt.net site just fine. Only Seamonkey gets the JBWEB error and only after I enter my userid and password and press Enter. Same error is I run in Seamonkey Safe Mode. I'll try a new account, that's about all I have left to try. If that doesn't work then I'll have to use Edge for this one site, which is okay as I like Edge. Just don't want to give up Seamonkey E-mail. If I'm ever forced to do so I guess I will move to IMAP with Outlook, but unless I'm forced to do so. So the https://www.att.com/shop/myuverse/dashb ... geTV-Plans page loads successfully, & you enter your un/pw successfully, though after that you error? Have you tried after starting SeaMonkey in Safe Mode? And if that doesn't work, test in a new, clean Profile? What happens if you start with either of these? Safe Mode, new, clean profile and both of the links all get the same error after I enter uid/pw. Starting with, https://www.att.com/my/, I just logged in successfully, ending up here, https://www.att.com/my/#/accountOverview. I have NoScript & uBlock (among other extensions). To test, I simply Allowed Globally in NoScript. uBlock I left as is. I have never logged in before on this computer. I did test this in a Private Window. My UA is lock stock & barrel, except I don't display 'Lightning', Mozilla/5.0 (Windows NT 5.1; rv:52.0) Gecko/20100101 Firefox/52.0 SeaMonkey/2.49.3. Some sort of blocking or interfering going on in your end? HOSTS file? Antivirus (in particular one that injects itself into https: streams? For me, it began early this morning (3 a.m. 6/15/18) on https:/att.com/my/. I have had no issues until now using the SeaMonkey browser (2.49.2). At the same time, I tried it on my mobile app, and after logging in it said the site was unavailable (I did not get a denied message on the app). To test, I tried Chrome, FF and Edge, all on Win 10 (vsn1803 build 17134.112 5/31/18. All showed the 403 error. As of this morning, the app is working as are FF, Edge and Chrome. But not SeaMonkey. I have done all the potential fixes: Cleared all private data, specifically deleted ATT.com cookies, shut down add ons, started in safe mode, reinstalled the browser (2.49.2) then installed updated version (2.49.3). Restarted the computer after each change to additionally clean things out. I even deleted Skype, as one commenter on another forum said that worked. Additionally, I checked SeaMonkey 2.49.2 on OsX Sierra (same config and add ons as Win10, in normal mode and no add ons turned off) and it worked fine.I then updated to 2.49.3 and it worked fine. So it seems to be some kind of sniffing or other issue with SeaMonkey on Win10. Also, FWIW, I can log into att.net fine on all browsers. So it would appear there is some script or sniff on att.com that is causing an issue. If this only occures on Win 10 1803 it might be the regexp bug in Windows 10. 2.49.4 will take care of it but has been delayed. Because 52.9 is just around the door now we will wait for it at this point in time to make sure to include the latest security fixes. Ah, forgot about that bugger. So it was fixed in FF 52 ESR & FF 59. FF 56 would not have been patched. And Waterfox, being FF 56 based, would have had to manually backport those fixes & I suppose he did not. 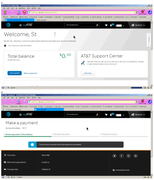 I'm on Win7 (so no issues with 1803, or Win10 in general ) so Waterfox works fine for me on at&t's site. Bill's 64-bit build, indeed, fixed it. frg wrote: If this only occures on Win 10 1803 it might be the regexp bug in Windows 10. 2.49.4 will take care of it but has been delayed. Because 52.9 is just around the door now we will wait for it at this point in time to make sure to include the latest security fixes.